Will common sense prevail, eventually, against profits? Electronics and car makers resist fixing a clear safety issue, putting profits ahead of people. The site has news, statistics, the latest research, a summary of state and local laws, and answers to frequently asked questions. Well, there’s common sense. And there’s money. Electronics, cellphone suppliers and automakers are resisting fixing what is a clear-cut safety issue, putting profits ahead of people, while NHTSA undertakes symbolic actions that do not effectively deal with the growing problem. In 2008, nearly 6,000 people died on American roadways in crashes that involved distracted driving, according to NHTSA. Distracted driving involves anything that takes your eyes off the road for more than two seconds, takes your hands off the steering wheel, or interrupts your concentration while driving. The use of cell phones or other electronic devices while driving is a significant and growing threat, particularly since it has increased exponentially in recent years. Moreover, studies show that texting while driving represents an even greater risk than talking on cell phone. Worse, young drivers are especially at risk. Their lack of driving experience can contribute to critical misjudgments if they become distracted, yet they text more than any other age group. It’s a trend that poses a growing danger, but the government is only slowly acknowledging the problem. 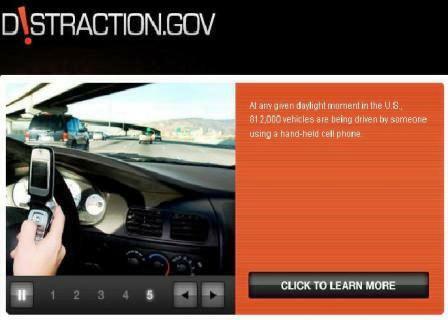 The U.S. Department of Transportation held a Distracted Driving Summit in late September to help identify the specific factors involved in distracted driving and discuss how to combat it in all forms of surface transportation, including rail, transit, commercial trucks and passenger vehicles. Driving vehicles that are owned, leased or rented by the government. Driving privately owned vehicles while on official Government business. Using electronic equipment supplied by the government, including cell phones, Blackberrys and other electronic devices, to text while driving any vehicle. Okay it’s a start, but LaHood, a Republican from Illinois, needs to go further. It’s time to make all forms of distracted driving illegal. Let the rulemaking process begin. Text messaging while driving is outlawed in 14 states for all drivers, in 10 additional states for new drivers and in one additional state for bus drivers, according to the Governors Highway Safety Association. Still, accidents are reported every day that involve driver distraction due to cell phone use. These accidents can result in injuries, car damage and car insurance rate hikes between 10-50 percent. Car insurance rate increases resulting from accidents vary by state and insurance company. However, based on a 2008 insurance.com study of the effect a violation or insurance claim has on auto insurance premiums and rates, the price can be high. Drivers who had a ticket saw their rates increase between $157 and $248 a year, while those who had an accident claim saw increases ranging from $302 to $458 annually. For more information about the dangers of distracted driving or to see car insurance rate trends by state, visit http://www.insurance.com. Seems to me that the tech content in vehicles is racing ahead so fast that it may well overwhelm drivers, notably that rapidly growing group of 65 plus drivers who are less tech savvy than younger groups. But, the profit margins are so strong on these software systems the automakers view these options as at least part of the answer as to HOW TO MAKE MONEY on small cars. I was recently talking with someone about the evolution of cars 10 years from now. With all the diverse on-board technology, ie expensive to repair, plus a wide array of powertrains, one wonders what residual values will look like as these tech marvels move into the hands of 2nd 3rd and 4th owners.